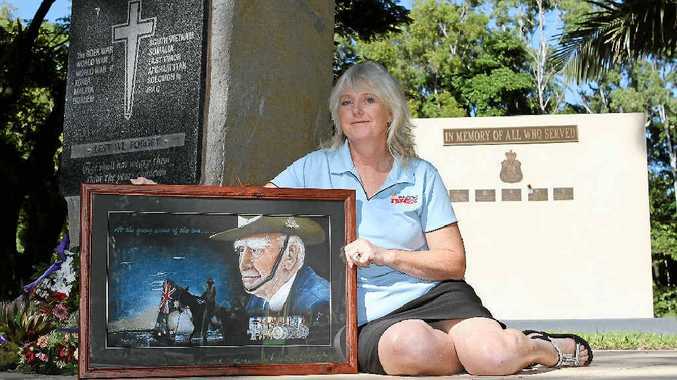 GOING HOME: Zoe Canfield’s prizewinning artwork ‘At the Going Down of the Sun’ will be gifted to 96-year-old Colonel William Whyte MC (pictured), who has been traced to a Sydney suburb. 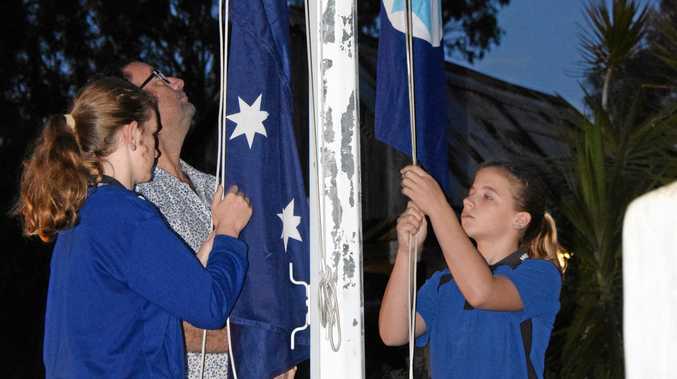 WHEN Zoe Canfield decided to enter the area's first Anzac-themed art competition, little did she know it would change her life. At first it was all about finding a face - trawling the internet to look for a man who embodied the characteristics of elderly Diggers. The face Ms Canfield found was that of Colonel William "Bill" White MC, a 96-year-old Second World War veteran. At this point, some four months ago, Colonel Whyte's identity was unknown to Ms Canfield - he was an anonymous face on a photograph in one of a myriad of virtual pages on the worldwide web. It was as the drawing progressed, however, she realised she needed to track him down. In a stroke of luck, she was watching TV when Colonel Whyte's face appeared on an advertisement for Ancestry.com. "Then I became really fixated," she said. "I put it on Facebook and I think I got half of Airlie Beach interested in trying to find him." Eventually it was close friend Tania Jarvis who traced Colonel Whyte to the Legacy organisation, which supports the families of returned servicemen. Through Legacy, Ms Canfield sourced a photograph of Colonel Whyte's medals to incorporate into the piece. "It was really important to me for them to be precise and that the whole picture be respectful," she said. On Friday night, the finished artwork, 'At the Going Down of the Sun', won first prize in the open section of the commemorative art show, which featured 91 artworks and attracted 580 people through the doors. Poignantly mounted beside it was a little tab saying "not for sale". Ms Canfield has arranged through Legacy to travel to Sydney, where she will present the drawing to Colonel Whyte at a Legacy lunch. Coming from a military family herself, with a father who served in the British Navy and a brother who was killed in active duty at the age of 18, Ms Canfield is thrilled to know her portrait is "going home". "It's an absolute privilege," she said. "This is a man who's given his whole life to the service of the country and that's an incredible thing." Colonel Bill Whyte was born in Ireland and joined the Royal Australian Army in 1937. Ms Canfield said from what she could gather, he was a man of few words when it came to his military prowess. "He only says his military career was a matter of regimental history," she said. Ms Canfield is grateful to her Smart Arts teacher Suzi Hancock-Janicki - who co-ordinated the Anzac art show and competition - for giving her the ability to capture the colonel's essence. "She's an awesome teacher," she said. "I feel like I've found a whole new me. It's changed my life."